What if we lived in a green future? Cities that didn’t just have green space, but cities that were green space. Trees and plants make up the structure of the city instead of concrete and plastics. Luc Schuiten thinks up cities using Archiborescence – the designs are cities that are grown and tended. Prairie parks, houses that hide under leaves, and skyscraper trees. The Vegetal City is conceived as a progression in time and space, through Luc Schuiten’s eye. It takes us on the path of this thoughts about Mother Nature’s presence as a model of a new way of building named by him “archiborescence”. For three decades, this eco-visionary has been imagining and realizing homes, urban landscapes, cities… inspired by all he has been able to observe in natural environments. The website opens the door to a harmonious future, possible through the modifications of our behaviours in our living environments. Nature is no longer considered as an inexhaustible manna from heaven but rather as an ally, likely to cooperate in edification of a long lasting society. A Study by University of Northern British Columbia professor Annie Booth, tracked the effectiveness and eating habits of a herd of goats over the span of two years in Prince George British Columbia. While any farmer could have told you that this was the case, Booth’s study is the first that actually quantifies the lawn management skills of a heard of goats. Another important effect is the lessened environmental impact of the goats on the (munched) environment, unlike weed whackers and herbicides the surrounding area had very little in the way environmental impact. The only detrimental effect would be the fertiliser deposits that goats leave behind. More a danger to shoes though, then the actual environment. Booth suggests that municipalities could save themselves some money, and manage their green spaces by leasing herds of goats during the summer months. If there is one thing that I can take from the incoming stats on Urban Neighbourhood is that a lot of people are interested in Urban Farming right now. For the past couple weeks the most heavily trafficked post on the site has been the Super Green Buildings post, about proposals for high tech vertical farms. Of course these particular structures are mostly theoretical as none of them have been built yet, but Urban farming is an active pass time that is growing more and more popular. Are you interested in eating more fresh, organically grown vegetables? Would you like to have a secure, sustainable food source in your backyard? Have you always wanted to have a garden, but don’t feel you have the time or know-how to get started? If so, you might be interested in the services that the Seattle Urban Farm Company provide. We use our collective farming and gardening experience to establish a productive organic vegetable plot in your yard. Give a thorough garden consultation, answering your questions and giving you new ideas and advice. Help revitalize an ignored or overgrown garden space. Help you design a new garden and plan out a multi-year garden strategy. Install a ready-to-go vegetable garden complete with clean, healthy, soil, drip irrigation, raised beds, and more. After an initial garden installation, provide weekly maintenance for your vegetable garden to keep your plants vigorous and productive, organically manage pests and diseases, and by using succession and relay planting techniques, harvest a weekly supply of fresh produce for you and your family. If you’re interested in learning about organic growing, we’re happy to work together with you and share our knowledge as we seed, care for, and harvest vegetables and flowers from your garden. We use only organic methods to manage your garden, so you’ll know your soil will be healthy and productive for years to come, and your vegetables will be free of herbicides, synthetic pesticides, and genetically modified organisms. By bringing the farmers to your yard, you help us share the risks of growing food. If the weather is poor, you’ll notice your garden is not as productive as it might otherwise be. If the weather is good, you’ll be savoring a bumper crop of delectable vegetables! One of the better things about companies like these is that they are sprouting up all over the place. a Google of Urban Farming Companies gives over 321,000 hits. Urban farming is actually an old idea, if you have ever seen old war propaganda videos you may have heard about the `Victory Garden` During the World Wars governments challenged urbanites to convert their lawns and ornamental gardens into food producing plots. Slogans like `Sow the seeds of Victory`and `Your Victory garden counts more then ever!` Were published on posters and in the media. It is estimated that nearly 20 million Americans planted Victory gardens and that 40% of all vegetables consumed nationally came from these gardens. The potential for our cities and urban environments by bringing back greenery and gardening is immense, the more food grown locally the less that needs to be trucked in, tomatoes from down the street have much lower shipping costs then tomatoes from 3000 miles away. More greenery on our roofs also helps cool the buildings and street scape below, reducing the Urban Heat Island effect and reducing Air conditioning costs. Ultimately speaking there next to no arguments against gardening in our cities that make any sense, so before you decide to plant another back yard full of ornamental plants mix in a couple rows of colourful veggies, they are still pleasing to the eye, but have the added advantage of being pleasing to the belly too! Is there any reason why you wouldn’t want your house to be built without using sustainable practices? Thinking long term the places tend to pay for themselves. How a new way of thinking about the buildings we live in will help solve issues of sustainability by reducing carbon emissions so you can become carbon neutral. This is about making buildings ‘nutritious’ for mind, health and ecology. One of the most exciting things we have been seeing lately is the use of engineered marshlands to clean up and reclaim water systems that have been polluted by our poor stewardship of the environment. Back in April of 2001 a group of Volunteers lead by T. Allan Comp Ph.D created a series of cascading pools planted with a variety of species of plants to filter a watershed which had become severely toxic with mining waste. Vintondale, Pennsylvania is a small coal patch town in Cambria County, It was created in the early 20th century by the Vinton Coal Company to support its underground mining operation and surface works. The watershed is a neglected ecosystem and Acid mine Drainage is a large water quality problem. Much of the area had resembled a gash in the earth itself. The good doctor and his multidisciplinary team worked with the community to create the wetlands project that fit the town’s aspirations for the site and still preformed the function of cleaning the water system. On the City of Kent website he talks about the project and how it came about. He goes on to express how these treatment systems can become living and working gardens that not only clean toxic waterways, but also offer places that engage the mind and honor the past. The projects also have the ability to turn community members from passive inhabitants into advocates for their community. The site has an excellent write up about how the project came about and how it works that I am not going to get into here but these engineered wetlands, like the Sustainable Storm Water Managment System mentioned earlier here on Urban Neighbourhood, offer the opportunity for us to create working environmental systems for our cities that offer enjoyable green space for us to use at the same time. Could you imagine wanting to go for a stroll through the water treatment plant? The Waterfront Trail was inaugurated this past year after the community organization in charge of the trail. The Waterfront Regeneration Trust was finally able to strike a deal after twelve years of hard work. The creation of the trail was no small undertaking with seventy different municipalities and other groups involved. The goal of the trust is to make sure that everyone has access to the waterfront and that the waterfront is worth getting to. The trail is designed to take into account the history of the area. Most of the shores of Lake Ontario and the portion of the Saint Lawrence River that the trail fronts on was settled by Loyalists fleeing the United States who wanted to remain loyal to the British crown. They exerted a profound influence on the social, political and business life of Ontario for more then two centuries and played a major role in the development of Canada. The trail bears witness to this history by passing a number of historical reminders; Loyalist College, Loyalist Parkway, Loyalist Township and even the Loyalist Motel. The goal of the trail is for it to link waterfronts from Niagara-on-the-Lake to Brockville and, then eventually, to connect it with Upper New York State’s Seaway Trail. It currently includes 31 communities, 182 parks and natural areas, 152 arts and cultural heritage attractions, 37 major annual waterfront festivals, and 170 marinas and yacht clubs. The trail is designed to be a multi-use recreation trail for use by people from all walks of life. The trail is also used by 24% of its patrons to commute to and from work. Currently the trail is about 30% off road dedicated path and 70% on residential streets or the paved shoulders of major roads. Most sections of the trail are paved but some are still gravel or packed limestone. In the future the trust seeks to complete the few portions of the trail that are as of yet secured and expand the trail through a further 52 projects along the waterfront. For more information on the trail check out their website. Plus Petrina, the promotions and events manager for the trust has added some great suplementary information about the trust down below in the comments section so give it a click and check out what she has to say! There is a great little gallery of rooftops posted on Flickr by one jwilly. It is a number of photographs of different roof top gardens and green spaces on top of the city. The possibilities are amazing when you consider the type of space a rooftop could be. Quite frankly I would argue that roofs are very under utilized. Look out on the roofs in the middle of most cities and all you will see is a sea of grey, blank spaces. Think about what kind of space a rooftop can be. If you open the access and add plants, you suddenly have a space that you can spend time in, a space that you want to bring other people into. Why shouldn’t every roof have a dwelling or communal space on top of i? Sure I know that most of the roofs in the city were not designed for these uses and therefore can’t handle the load, but we should be thinking that way from now on shouldn’t we? It isn’t often that I get really excited about the things I read but I positively nerded out when I started reading about a pilot program for Sustainable Stormwater Management that Kevin Robert Perry designed for the city of Portland. One of the most exciting things occurring in Urban Hydrology right now is a return to basic low-tech solutions that not only cost little to maintain, but beautify the area’s they serve. The NE Siskiyou Green Street is a project that is so simple in its basic premise that the benefits become self evident as soon as you look at it. It is one of those visionary ideas that took a landscape architect willing to think outside of the high-tech box to come up with. The premise, allow Mother Nature to do the work she is already equipped to do by bringing her back into the equation. The NE Siskiyou Green Street project removed a portion of the street’s parking zone and converted it into a pair of landscaped curb extensions. Curb extensions are ideally suited for residential applications on their own as they act as traffic calming devises and thereby increase pedestrian safety. In this case they go one step further. The curb extensions on this street also capture, cleanse and infiltrate storm water runoff. The project basically removes NE Siskiyou St. from the city’s storm/sewer system and manages the runoff locally. Water flows down the approximately 10,000 square feet of of NE Siskiyou Street and the driveways leading off of it until it reaches the seven foot wide curb extensions. The curb extensions have an eighteen inch cut that allows the water to enter the curb extension. The landscaped area within is designed to hold up to seven inches of water, allowing the landscaped area to infiltrate the water. The water is slowed and contained using a series of rock berms that facilitate the curb extensions three inches per hour infiltration rate. In the event of a very intense storm there is a curb cut at the lower end of the planting that allows excess water to flow through and enter the city’s established storm/sewer system. The extensions are planted with a series of native plants including Oregon grape, sword fern, and grooved rush. The grooved rush does the majority of the storm water management. The upright growth structure of the grooved rush slows down water flow and captures pollutants while its deep penetrating roots work well for water absorption. Another advantage to this type of local solution is that it keeps the rain where nature put it. Part of the issue with the way that cities currently deal with storm water runoff is that the water is removed from where it fell and away from the local plants that could use it. This system restores water that had been shunted away, back to the local environment. The Conseil régional de l’environnement de Montréal group in Montreal was interviewed in the Gazette the other day about urban heat islands. If you are unsure as to what these are, just consider the difference between being in a parking lot at the end of a hot day vs. being in a park at the end of a hot day. Chances are you are at least subconsciously aware that the park is much more comfortable and much cooler. This effect has to do with the fact that, while plants and greenery tend to shade and absorb heat, concrete, pavement, and asphalt tend to reflect and then store heat, not only intensifying the heat during the day, but keeping the area warmer over all by releasing it later in the day. If you don’t believe it, try walking past a blank brick wall that has had sun all afternoon and once the sun is down and pay attention to the temperature. Cities tend to exacerbate this problem as these materials form the majority of their components. In many cities the temperature is 5 to 10 degrees above the regional average. To combat hot spots, the city of Montreal has teamed up with the Conseil régional de l’environnement de Montréal and the Conférence régionale des élus, a regional development group, to create more green spaces with the help of concerned businesses and residents. So far, their are more than 30 participants, including Pierre Elliott Trudeau Airport, Alcoa and Hydro-Québec. “We need to start building a greener city,” said Helen Fotopulos, the city of Montreal executive committee member responsible for parks and green spaces. Creating more parkspace will not only improve the look of our cities it can also help our bottom line by making the city less expensive to cool. Just in case you needed another reason to love parks. Urban gardening seems to be in the news a bunch lately.. I just came across an article in the gazette this morning over coffee and another article on Spacing Montreal. The city has a number of community gardens scattered around town, though that number has been reduced with 167 of them having been closed due to soil contamination. At McGill University, a group called “Campus Crops” has formed with the goal of identifying underused places on campus and turning them into productive agricultural land. The folks over at Spacing Montreal have a great article.. enjoy! One of the great things about living in an urban area are the extras that you only get once cities are of a certain size. Many of these gems are places that as a local you will tend to forget about until you have an out of town friend come to visit. This past weekend we headed to one of these extras when we visited the Botanical Gardens in Montreal. The Gardens in Montréal are comprised of a main pavilion done in a deco style, much like many of the assorted public markets in the city. The Main buildings were designed by Architect Lucien F. Kéroack in 1932, and are completed in 1937 after being stalled for four years. The four years saw the project left in disarray and some of the greenhouses were turned into Rabbit hutches. Work on the project was restarted in 1935 after Camilien Houde is elected mayor and Brother Marie-Victorin makes an impassioned plea about the cities need for a botanical garden. “We will soon be celebrating Montréal’s three hundredth anniversary. You need to give a gift, a royal gift, to the City, our city. But Montréal is Ville-Marie, a woman…and you certainly can’t give her a storm sewer or a police station…It’s obvious what you must do! Give her a corsage for her lapel. Fill her arms to overflowing with all the roses and lilies of the field!” source. Over the course of the next 70 years the gardens continued to develop after a wartime lull. The Gardens have an extensive collection of different plant types and species with number different themed gardens, after a trip to the insectarium we took a tour through the Japanese garden which would definitely have to be one of the most calming gardens I have been too in a while. While I was disappointed by the number of stay off the lawn signs, that’s a discussion for later. If your city has a botanical or public garden take the time to reacquaint yourself. 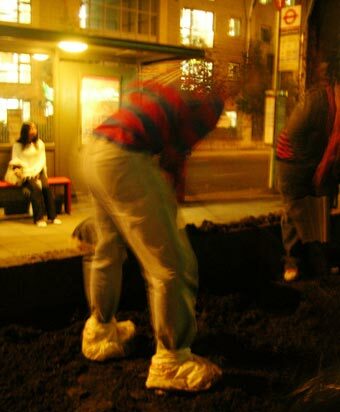 Guerrilla Gardener’s operate under cover of night, moving in and acting as ‘agents of mass beautification’ planting flowers and other types of greenery in neglected medians and vacant spaces. They have to operate under cover of night as what they do is considered illegal, contravening bylaws that prohibit the modification of municipal lands and spaces. They lob seed bombs and plant flower mines. In Montreal there is a guerrilla gardener turning a former railway yards into a Roerich Gardens. In case you are unfamiliar with what a Roerich Garden is, its what museums and cultural institutions planted in 1935 to mark schools, museums, and cultural landmarks to prevent them from being destroyed during aerial bombardments. The plant artist is trying to draw attention to the fact that while the medow (which is listed for redevelopment) doesn’t appear to be an active public space, plenty of people use it and enjoy it. Plus she is doing it for “sheer visual pleasure.” source. There are people around the world who take otherwise neglected pieces of land and turn them into spots of urban beauty. I mean really, one can not argue that our cities don’t need more plants. The Guerrilla Gardening hompage is run by a Londoner and started off simply as a blog about the illicit gardening missions he undertook and has since evolved into a resource with notes on Guerrilla Gardening missions around the world. This is one movement that I fully support and would hope that our city officials would recognise the value of letting these “agents of mass beautification” go to work unhindered. Besides its city beautification that cities don’t have to foot the bill for, how can they say no to that? In New York City an organisation called “Friends of the High Line” are in the process of converting a previously abandoned freight viaduct that runs along the lower west side of Manhattan from a ‘lost space’ to a new elevated park reserved for pedestrians. The idea is not new, there is currently another elevated park in Paris called The Promenade Plantée. The project is designed to increase the available parkland in the city by turning what some have considered a blight into a unique advantage, looking through some past entries about this online it is clear that there was much debate and a serious push to have the whole structure removed. Link I for one am happy that the friends of the high line have been successful in getting the go ahead to convert the structure to an urban promenade. Unique parks and themaintenance of structures of historical significance is a big plus to me. Structures like this begin to make us relate to the city in further levels, most people are only used to considering a city from the ground level, sure we have subways and underground structures, and sky walks in some urban areas but most don’t really consider them when thinking of the strata of an area. Subways are underground and you don’t really see anything so its easy to have no awareness of the city that you pass through on your way between your usual stations and sky walks tend to insulate us from the city by being too much like the interior of the buildings they connect. Elevated walkways like thePromenade and the future high line allow us to experience the city from above while still being in contact with its sights and smells, I have a feeling that once completed this project will become a valued part of the neighbourhoods it connects.